Florian "Venom" Kohler is an 8-time World Artistic Pool Discipline Champion, a 6-time Guinness Book World Record Holder, and Venom Trickshots has over 600,000,000 views on YouTube! 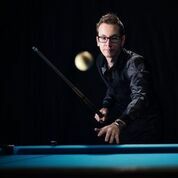 He started playing pool as a teenager, and quickly turned into one of artistic pool’s biggest stars through his creative shooting and highly visible online presence. If you haven’t seen a Venom Trickshots video, you really should check out his YouTube page.